With this glossy magnetic whiteboard sheet (the backside is magnetic), you can turn an iron surface into a whiteboard in no time. Just cut the sheet to the desired size and attach it to an iron (ferromagnetic) surface, a steel plate or a metal frame for instance. Now you can write on it with dry erase markers and wipe it dry. You cannot print on the whiteboard sheet though. When you are done using it, you can just remove the whiteboard sheet, roll it up or apply it up somewhere else. Ideal for use in the office or classroom, booth or store construction. The magnetic whiteboard sheet is not suitable as a magnetic base for magnets! The magnets would even demagnetise the sheets. 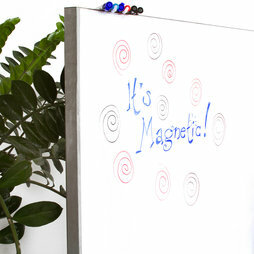 A good base for magnets are our ferro-magnetic whiteboard sheet.